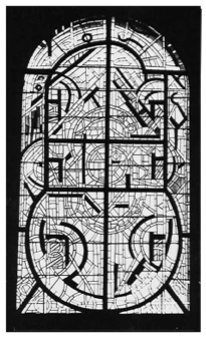 One artist in the Gleizes circle who secured at least two important commissions in churches for purely non-figurative work was René Dürrbach. 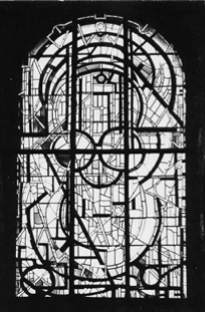 Dürrbach was very much on the 'Guénonian', or at least the esoteric/gnostic side of the Gleizes adventure. His work even when apparently non-figurative was heavy with symbolic meanings. 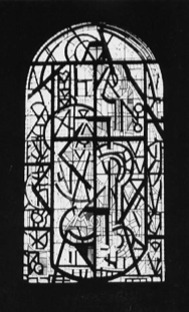 In general however, except in his work as a sculptor, he abjured the human figure. His wife, Jacqueline, was a weaver, particularly known for her tapestries based on paintings by Pablo Picasso, most notably the Guernica which used to hang at the entrance to the UN Security Council chamber. 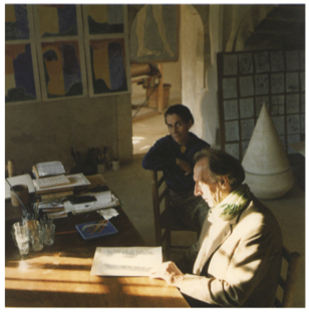 René Dürrbach prepared the cartoon for it and both he and Jacqueline worked closely with Picasso. Dürrbach's work has sometimes struck me as a most intriguing fusion of Gleizes and Picasso - Picasso with the figurative element stripped away. 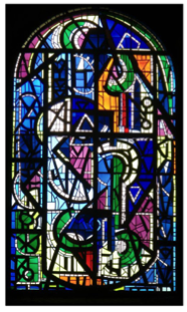 As well as painting and sculpture he also worked in stained glass and in that capacity did complete schemes for churches in Épenoy, in the Doubs area, in Eastern France, and in Charleville-Mézières, in the North (Charleville being known for its association with Arthur Rimbaud). I often feel, however, that Dürrbach is stronger in black and white. Something he has in common with Picasso. 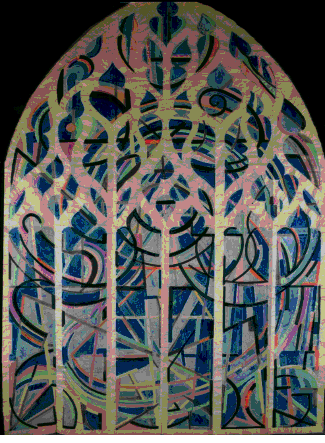 I visited this church with Genevieve Dalban and we sat for a long time quite absorbed, rather overwhelmed by the windows. I could not help wondering however if I would like to attend mass in their presence. It would be like taking Holy Communion in the middle of a firework display. This comes from one of the most astonishing exhibitions I have ever visited in my life. 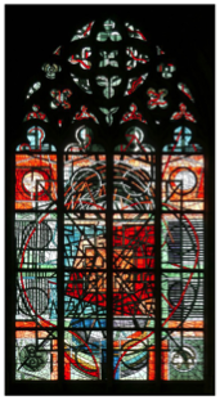 It is one of a series of cartoons Dürrbach prepared for a competition for the windows of Nevers cathedral. Dürrbach prepared a complete scheme for the cathedral painted on brown paper to scale - each of them several metres high. The exhibition also included a stations of the cross in which each of the panels consisted solely of a circle and a cross. The difference between the stations was conveyed uniquely by the angle of the cross in relation to the circle. 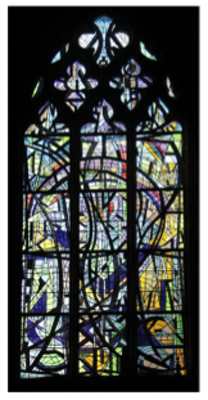 Dürrbach didn't get the commission - he was offered one window but wasn't interested in anything less than the whole scheme.